Both Moran Yacht & Ship and Merle Wood & Associates are hosting three separate brokerage open days this afternoon. At the Rybovich Yard in West Palm Beach, Moran Yacht & Ship invite brokers to visit the 130ft Westport superyacht Mary Alice II, between 1600-1900hrs. Launched in 2002, the yacht has accommodation for ten guests, a cruising speed of 22 knots and an asking price of $11.75 million. 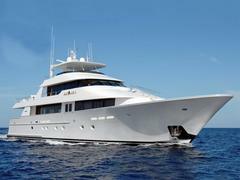 Also at the Rybovich Yard, guests will be able to visit 44 metre superyacht Lady Kathryn III. News from Moran overnight confirms that the price for the 145ft NQEA yacht has been reduced from $17.95 million to $14.75 million. Meanwhile, at Bahia Mar ‘F’ dock in Fort Lauderdale, Merle Wood & Associates are presenting the 48 metre Nice n’ Easy, also between 1600-1900hrs. With six staterooms and a maximum speed of 17.5 knots, the four year-old, Christensen motoryacht has an asking price of $27.9 million.